Cheap flights from Amsterdam to Bangkok, Thailand from €367! Non-stop flights from the UK to Beijing, China from £374 return! Cheap flights from Amsterdam to Bangkok, Thailand from €348! One more deal today with Xiamen Airlines from the Netherlands this time to Bangkok also at the end of local high season. If you are budget travelers in Amsterdam who is looking for the cheapest flights check out this promotion with SkyTeam. Fare is inclusive of all taxes, onboard meals and checked-in bag. Find below the lowest priced deals Netherlands Thailand and book your next cheap flights from Amsterdam to Bangkok based on promotion of Xiamen Airlines! Xiamen Airlines promo sale offers the cheapest flights from Amsterdam to Bangkok from 13th of February to 26th of March 2019. At this moment limited availability also at the end of next main tourist season in Thailand. Max stay 1 month. You can book cheapest flights Amsterdam Bangkok by 12th of December 2018. Below you can refer to our booking as well as few travel samples. Bangkok, official name Krung Thep Maha Nakhon, is the capital of Thailand and, with a population of over eleven million inhabitants, by far its largest city. Its high-rise buildings, heavy traffic congestion, intense heat and naughty nightlife may not immediately give you the best impression — but don’t let that mislead you. It is one of Asia’s most cosmopolitan cities with magnificent temples and palaces, authentic canals, busy markets and a vibrant nightlife that has something for everyone. 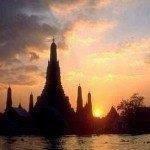 Are you up to visit this classic and probably the most demanding destination in South East Asia? Then book cheap flights from Brussels to Bangkok! For years, it was only a small trading post at the banks of the Chao Phraya River, until King Rama I, the first monarch of the present Chakri dynasty, turned it into the capital of Siam in 1782, after the burning of Ayutthaya by Burmese invaders but they did not take over Ayutthaya. Since then, Bangkok has turned into a national treasure house and functions as Thailand’s spiritual, cultural, political, commercial, educational and diplomatic centre. If you have booked these cheap flighs from Amsterdam to Bangkok you can read more about this city at Wikitravel. Travel dates. : Compare the cheapest flights Brussels-Bangkok at website of the carrier. Need affordable hotel in Bangkok book your accommodation via Booking.com or Hotels.com. If you have booked these cheap flights from Amsterdam to Bangkok you can also compare best prices for car rental in this destination via Rentalcars.com. Booking sample of cheap flights from Amsterdam to Bangkok, Thailand from €348! Your outbound date from the Netherlands to Thailand would be on 23rd of February. Inbound flight from this South East Asian country back to Amsterdam on 8th of March 2019. Take advantage of this latest promotion from Netherlansy to Thailand and book the cheapest flights from Amsterdam to Bangkok!